Good morning Team Strykerians! I hope you had a great weekend and are ready for the newest page of Team Stryker! With this issue I wanted to do a lot more different locations in one issue. There are a total of 4 totally different locations: inside the Team Stryker base, outside Madison Square Garden and now we are inside the stadium. The stadium was one of the harder locations to do (especially in the coming pages) but it was a really fun challenge. It was nothing compared to the final location so be sure to stayed tuned to see where I take Team Stryker next. 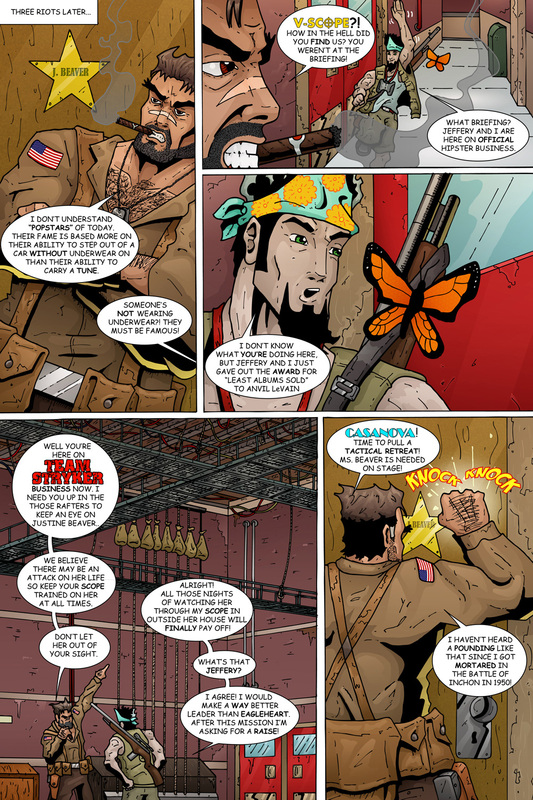 With today’s page we have the triumphant return of Jeffery (not seen since Mission 002) and he is just as maniacal as ever. V-Scope and Jeffery never attend the briefings with General Strongbottom, but they always manage to be at the right place at the right time. I figured if anyone was going to be handing out awards at the First Annual Hipster’s Choice Awards it would be V-Scope and Jeffery. It’s now just 5 days until the Calgary Comic Expo! If you’re in the Calgary area between April 26-28 be sure to come down and find me in Artist Alley in section M01! I’ll be there with Team Stryker Mission 001-003 in paperback.